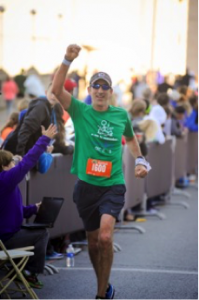 The KCTC Lee’s Summit Running Group is pleased to highlight Tim Hazlett as our featured runner for March 2016. Tim is more than a genuinely nice guy, he is a well-rounded and talented individual to boot! He is soft spoken and very humbled both by and with his accomplishments. Tim is a dedicated runner with lots to be proud of completing lots of road races to include three Boston marathons (with 2016 in sight). We are happy Tim is part of KCTC Lee’s Summit Running family! Hobbies/Favorite Team: In addition to running, I am a huge classical music fan. I write a blog about classical music: timhazlett.blogspot.com. I also play the violin, guitar and bass. I love baseball-the KC Royals are my favorite team of course. I am also a KC Chiefs fan. I also enjoy reading (history especially), cooking, cycling, and drinking coffee, wine, beer, and scotch. (not necessarily at the same time though). I have been a vegetarian for about 8 years now too. Tell us a little something about your running journey: My mom started running in the mid-‘70s and still runs to this day. She is my running inspiration. I started running 30 years ago-I ran a 10K and thought it was going to kill me. But I kept at it. Then in 1994 I ran a half marathon and I would say that’s when I really became a runner. I ran my first marathon in 2002. Running is my source of peace and tranquility, as well as physical fitness. Running is also a great way to meet other people and make friends. How many races have you completed and any running goals: I have run 51 marathons (44 road and 7 trail), 2 – half marathons, a 10K, and 3 – 5K’s. At this point, my goal is just to keep running as long as I can. I’d like to reach the 100 marathon mark by the time I am 60. (I reached 50 marathons when I was 50). Your favorite thing about KCTC Lee’s Summit Group: For many years, I ran by myself, which I enjoyed at the time. But I soon realized running could be even more fun if you have people to share it with. I have met so many great people and made friends through KCTC-LS. We have a true sense of comradery and “community” that I really love. Year round, they are there for you, even on those dark, cold, windy days in the dead of winter. New runners are always welcome, regardless of experience or speed, so we have a very well-rounded group of people, where everyone is made to feel welcome.